Wishing Happy Holidays to all! 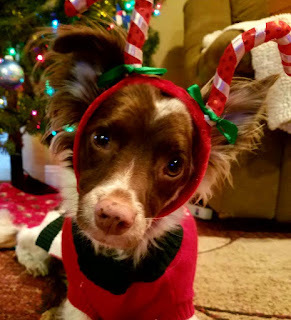 Wrangler is a special needs rescue dog who has an esophageal disorder (cricopharyngeal achalasia) that requires a feeding tube and constant management by his Mom Gina. Ask Ariel friend Gina Gould is an acuscope therapist and her treatments, TLC and the dedicated support of Leashes of Love Rescue have given him a chance to live a "normal" life. Thanks to all the caring parents of special needs pets and the wonderful rescuers who save thousands of dogs and cats that would otherwise perish in the shelters. Having a special needs pet is a lot of work and requires extra time that many of us don't have. It's always a miracle when a doggie as special as this one is able to live out his life because of the incredible dedication of a group of people who are deeply dedicated to the welfare of animals.